Everybody understands a flat roof is a different design style than a pitched roof, as the flat roof uses different engineering and architectural concepts to maintain its structural integrity. Common sense says the flat roof is going to need routine roofing inspection, maintenance, and occasional roof repair or replacement, but the average layman isn't likely to understand the intricate details of such procedures. Fortunately, a little research can make you familiar with the general needs of your roof and there are professional roofing specialists available to help with the specific needs of your building. The rule of thumb for roofing repairs is to understand it was designed to withstand ordinary weather and part of the design was thought out and prepared the roof for the most common types of damage which can happen. Of course, if a tree falls on your building, that's not something it was intended to withstand. You can assume, however, there are established practices to conduct repairs after the heavy winds associated with a severe hailstorm, or the ice damage caused by an exceptionally severe winter. What is important with a flat roof is to conduct annual inspections and repair any potential problems before they have a chance to lead to the more expensive building damage of water leaks. Like anything else in this world, a roof does eventually wear out and need to be replaced. Generally speaking, a roof which is well maintained and properly cared for is going to last the extent of an average adult lifetime, so you may never need to conduct a roof replacement. The caveat here is, that's if you conduct the annual inspections and maintenance, and take care of any potential problems before they become a more dire issue. If you take care of your roof, it will continue to take care of you. If you should need to install a flat roof, whether on a new building, a replacement on an older building, or as a repair after an extraordinary event, there are modern options to consider before deciding on the specific roof you want on the building. The standard flat roof consists of a membrane, often held in place with gravel or alternatively glued and tacked to the roof structure. 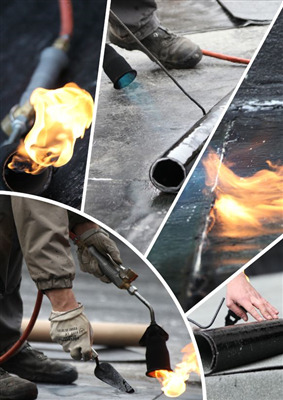 Whether you choose a rubber membrane, TPO membrane, or Duro-Last roof depends on your needs and expectations of the building and the weather conditions where you live.